Livingponds Versatile Waterfall Filter - Create Professional Looking water features with the Savio Livingponds filters. These filters provide complete, low maintenance bio-mechanical filtration not only for ponds, but aquaponic systems as well. This filterwith its injection-molded housings are super tough but also offer a perfect blend of style and functionality. Savio Livingponds Filters were engineered to harness the natural dynamics of moving water. Their cylindrical design puts water into a self-cleaning, highly dynamic "spin-cycle". 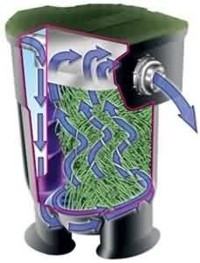 This process removes the heaviest debris before it gets to the filter media, and ensures that water is evenly distributed throughout the filter chamber. The net result is a filter that operatesnearly 4x more effectively than box filters. Cleaning a Livingsponds filter is a breeze! All Savio Livingponds filters use Savio Springflo - the original, patented media that resists clogging, compaction and channelling. To clean simply agitate the media, then drain the filter. Using the optional bottom drain accessory simplifies this task even further - allowing you to empty the nutrient-rich fish affluent into the garden or into a tank for further mineralization. 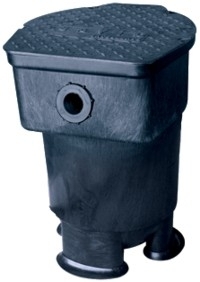 Savio Livingponds filters easily handle water up to 5,000 gallons. But if you need more capacity, Savio's modular design makes it easy to connect multiple units together. * Dimensions: 23.4" x 22" x 30.5"